Superb personal service from the lodge staff. The team at Geiger’s Camp are fantastic hosts who inevitably make their pampered guests feel right at home – chances are you’ll leave feeling like life-long friends! It’s the perfect example of why we at Bushscapes prefer smaller, more intimate and personal lodges! 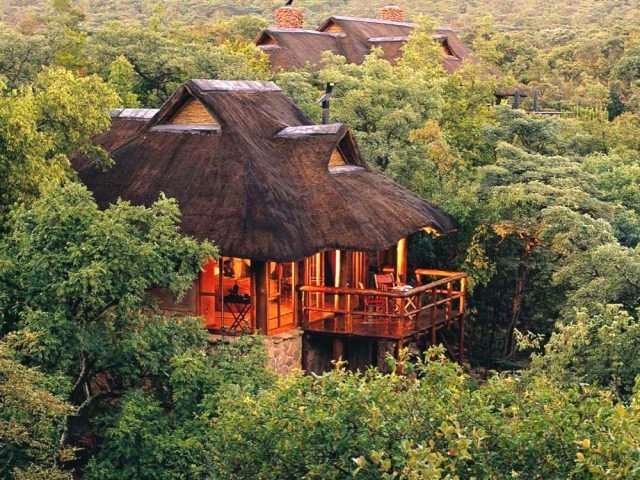 Perched on a ridge above the plains of the Timbavati, Geiger’s Camp offers a panoramic view of prime Big Five territory. 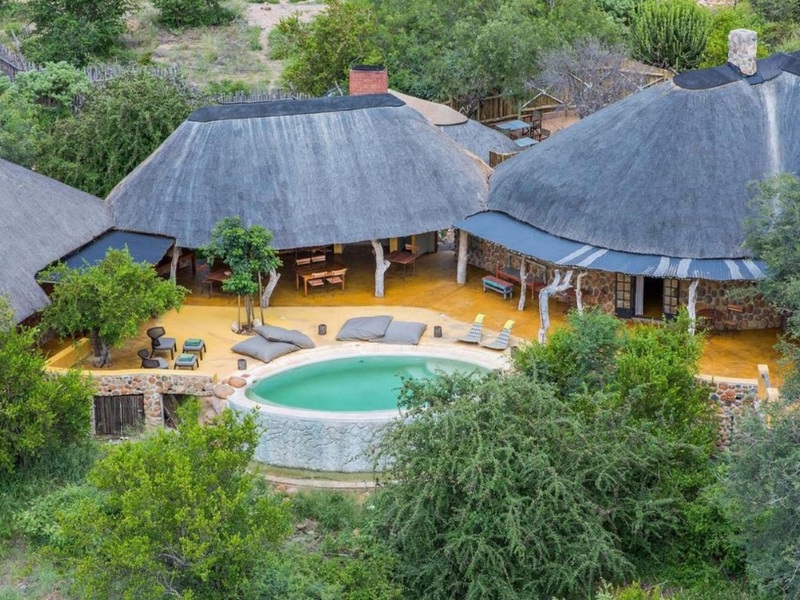 Once the private home of the Motswari owners, the Geiger family, Geiger’s Camp has now been converted into a gorgeous little lodge of just 4 bedrooms that boasts intimacy, character and charm in spades! It successfully retains the homely charm and warmth while bringing all the luxuries that modern bush lovers desire – it really is the perfect fusion of tasteful and understated elegance with authentic rustic charm! In fact, taking this “home from home” theme even further, Geiger’s is really the perfect place to hire on an exclusive basis for a bush get-together with family or friends. The traditional architecture of the lodge with its rough stone walls is complemented by sumptuous antiques and quirky and interesting art pieces. The influence of artist/owner Marion Geiger-Orengo and Cape Town interior decorator David Strauss are evident in the lodge’s new décor which fuses elegant traditional touches like Victorian-style ball-and-claw baths and copper basins in each bathroom which evoke a strong sense of history, with more contemporary elements such as the paintings by Geiger-Orengo which hang in all of the 4 private rooms. This historical authenticity also doesn’t mean they’ve lost track of more modern trends though: for example, large outdoor showers put you outside the house and in contact with nature whilst the infinity pool presents an attractive and oh-so inviting way to escape the heat of the lowveld summer. Motswari Geiger’s Camp is within the Timbavati which shares an unfenced border with the legendary Kruger and so the game viewing on offer at Geiger’s Camp is second to none. The Big Five is a common sight for the greater part and this is possibly the next best place in South Africa after the Sabi Sands to enjoy leopard sightings. 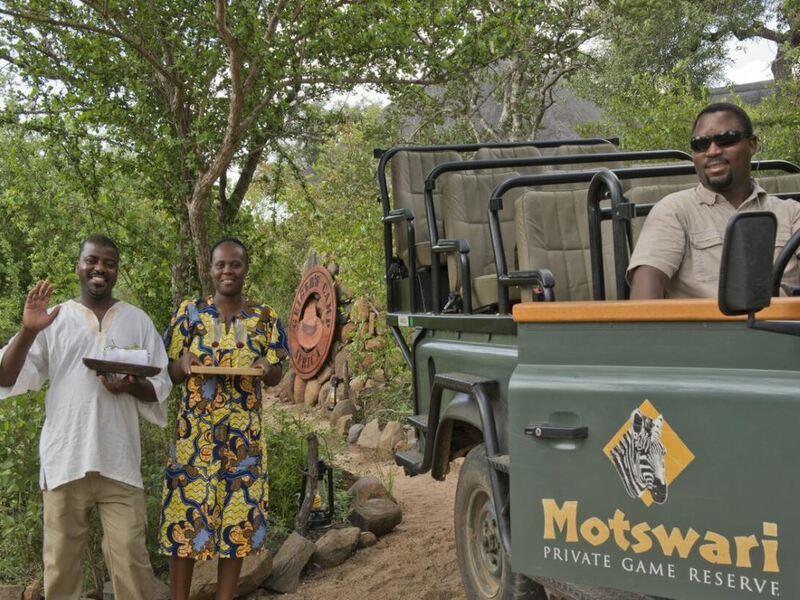 Motswari’s guides are renowned for their quality and they’ll do their utmost to get you right up the very best sightings. Game drives are hosted twice daily, in the morning (coffee is provided to chase away the early-morning tiredness) and again around sunset - what is really great about these drives is that the reserve comes without the tarmac and busy-ness of the main Kruger National Park public areas, lending a wilder, frontier type feel to the whole experience. Bush walks are also available whilst another great option is an overnight walking safaris, where after experiencing the bush close up and personal on foot together with your experienced ranger, you’ll camp down for the night in a tented camp tucked away deep in the bush where you’ll exchange bush tales around the log fire with the nocturnal sounds of the African bush as your background music. Once the day’s activities are over, Geiger’s Camp is the ideal place to simply sit back and relax. A ‘High Tea’ is served in the afternoon, with fresh salads and home-baked cakes, and you can take it beside the scintillating cool waters of the oval infinity pool that spoils you with an unhindered view of the spectacular African bush. 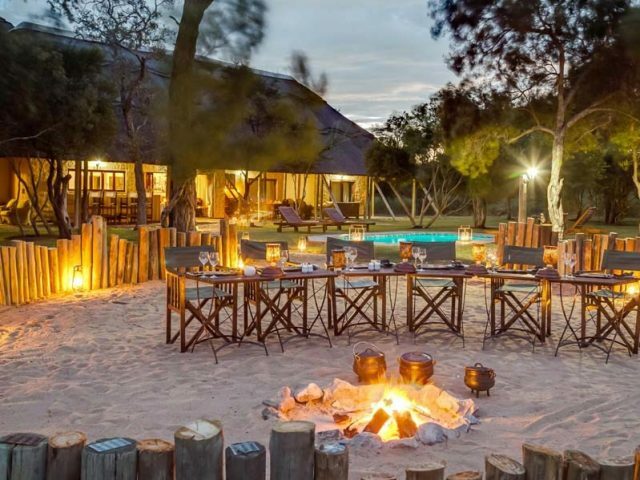 Later, the camp’s chef whips up delicious gourmet dishes which you can enjoy a sumptuous lunch or dinner by the poolside – or, even better, in the traditional boma around a roaring log fire. This is the perfect time to try one of their many award-winning South African wines, or perhaps a traditional Gin and Tonic. It doesn’t end at dinner, however. Guests are free to take a nightcap in the library, which provides an astounding collection of books, spanning from bird books and guides detailing every imaginable fact about the animals you’ve seen, to fiction and works of historical import. One thing that really stands out amongst all of the guest reviews for Geiger’s Camp that we’ve ever seen is that guests inevitably rave about the superb personal service they enjoy at the hands of the Geiger’s team – it’s the norm to have individual staff members picked out by name for special praise. This is really the beauty of staying in such a small and intimate lodge – with just 8 guests, the staff really get to know their guests and interact with them on a truly personal basis! Whereas in most lodges you’re just one of thirty (or even fifty) guests, here the personal, intimate touch is tangible and very, very welcome. It’s quite fitting, then, that their slogan is “arrive a guest, leave a friend” – Geiger’s Camp certainly makes good on that promise and that’s why it rates as one of our absolute favourites! Unless otherwise stated, all rates listed are based on a minimum 2 or 3 night stay, dependent on travel dates. Surcharges may apply for a 1 night booking. Rates quoted are only applicable to South African Residents. Discounted rates for International Residents are available on request. Entrance Fee of R 150 per vehicle applies, for self-drive guests, subject to change.